More commonly found in kitchens, fitted furniture is becoming an increasingly popular option for bathrooms, and with good reason. 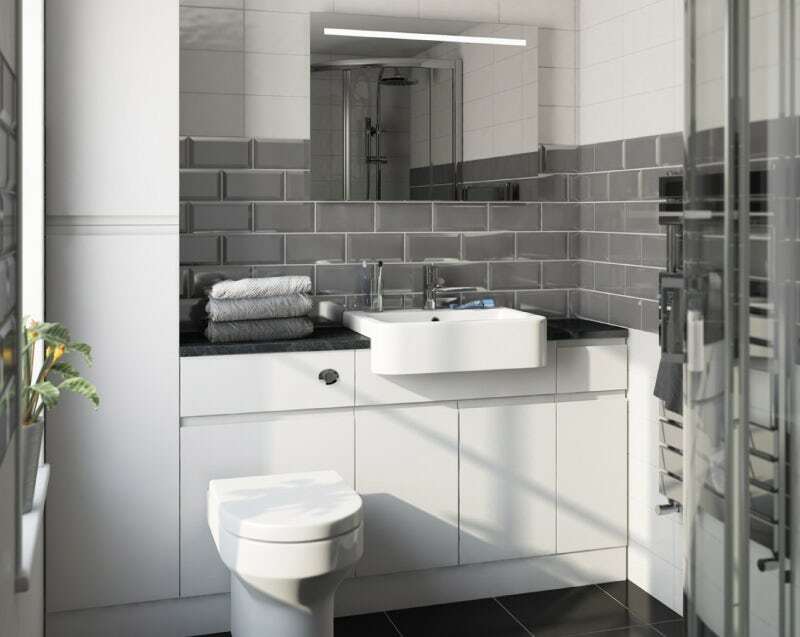 In this handy fitted bathrooms buying guide, we’ll show you what a fitted bathroom is, why it could benefit you and examples of fitted bathroom layouts. You can also discover all the beautiful fitted bathroom furniture ranges available right here at VictoriaPlum.com. What is a fitted bathroom? The basic bathroom layout includes, at the bare minimum, a toilet, basin and a bath, shower or shower bath. Usually, you will find all of these elements situated separately to one another but perhaps purchased as a matching bathroom suite, for a coordinated look. However, with lack of space being one of the most commonly cited reasons for a lack of dissatisfaction within the home, there is an increasing pressure to create additional storage space where and whenever possible. This need for additional storage may lead to the buying of bathroom furniture, but with no coordinated plan, furniture bought as an afterthought can simply look tacked on and a little out of place. Before you know it, your furniture could actually be causing the clutter itself! If you've ever stayed at a swanky hotel, you may already be aware of what a fitted bathroom looks like. Much like a fitted kitchen in most respects, fitted bathroom furniture can be built into your bathroom design along one wall, to give a clean and uniform look to your home, but can also use 2 walls if space allows. They help to conceal unsightly pipework for a neat and tidy finish. They make optimum use of your space, combining storage cupboards and drawers with a countertop, vanity unit, basin and back to wall toilet. Corners, which are often dead spaces when it comes to bathroom furniture, can suddenly become useful storage areas. With everything fitted into the one space, it frees up the rest of your room for other elements, including a shower, bath and heating. You can choose any combination of units to fit your exact layout and still achieve a clean and contemporary look. Storage is the key element within fitted bathrooms and you'll most commonly require at least 1 cupboard, for cleaning products and toiletries. You can even incorporate a set of drawers, for those smaller items such as makeup, tweezers etc. If you like, you can expand your storage space further through use of a tall cabinet, giving ample room for spare towels, linen or even clothing, easing the pressure on other areas of your home. A mirror cabinet might not necessarily be something that immediately springs to mind when thinking of fitted bathrooms, but it certainly pays to invest in one that matches your fitted bathroom furniture. A large mirror not only gives you somewhere to apply makeup or shave, it also provides a vital function, enhancing the feeling of light and space. With the cistern neatly concealed behind a panel, your back to wall toilet fits seamlessly into the design. Your countertop can then continue uninterrupted across the top of this unit for a pleasing layout. Of course, you can then pick a back to wall toilet that suits your tastes. Combine a semi recessed basin with a storage unit to create a beautiful vanity unit that will fit neatly with the rest of your design. Plus, with an undersink storage space, you'll have even greater options when it comes to de-cluttering. All our semi recessed basins are made from high quality glazed ceramic that simply wipes clean. They come complete with a single tap hole and integral overflow, so you can personalise with your choice of mixer tap and waste. The pièce de résistance is the worktop area. Available in a range of colours, all our worktops are made from highly durable MDF and, for added peace of mind, come with FIRA (Furniture Industry Research Association) gold product certification. This is a third party validation scheme for the furniture industry, meaning our worktops meets all the latest and necessary standards. The plinth is height adjustable and adds the finishing touch to your fitted bathroom. It covers the adjustable feet and space below your furniture whilst still allowing you access for cleaning and maintenance. 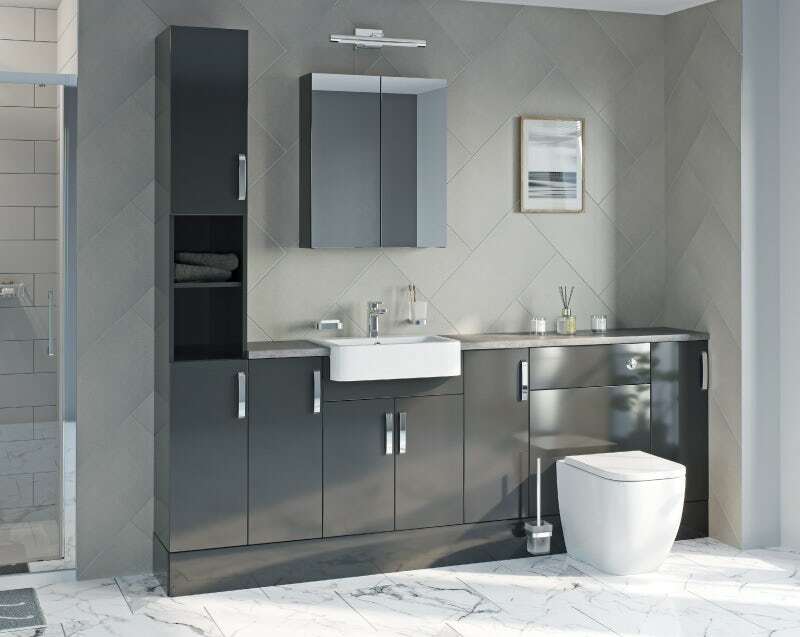 From Orchard Bathrooms, Wharfe is one of our most popular fitted bathroom furniture ranges. You can buy any of our pre-designed bathroom packs or each item individually if you prefer. 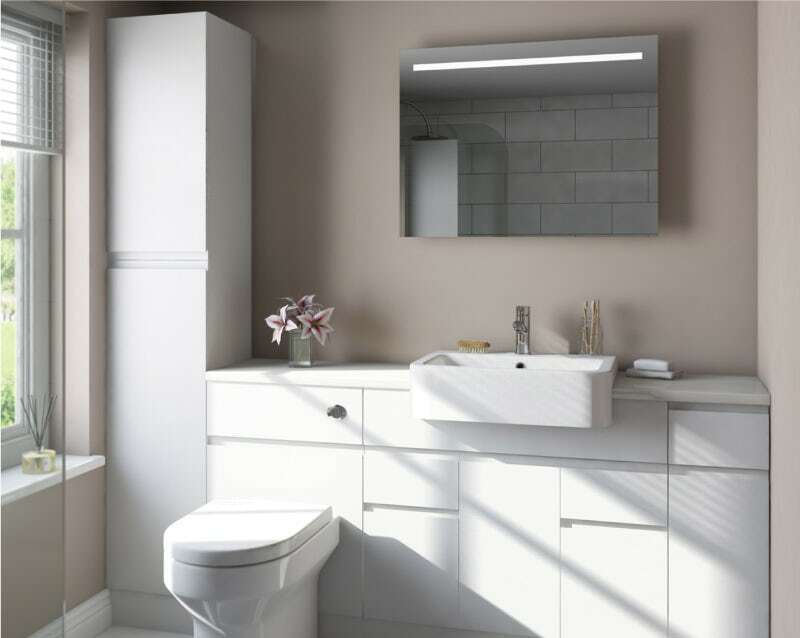 Featuring a durable white gloss finish that is easy to clean, Wharfe is ideal for family bathrooms. Complete with sleek recessed handles and soft close doors and drawers, it provides a highly contemporary look. Choose from 3 high quality laminate worktops, including white, black and beige, each with FIRA (Furniture Industry Research Association) gold product certification, the recognised quality mark for products within the furniture and industry. 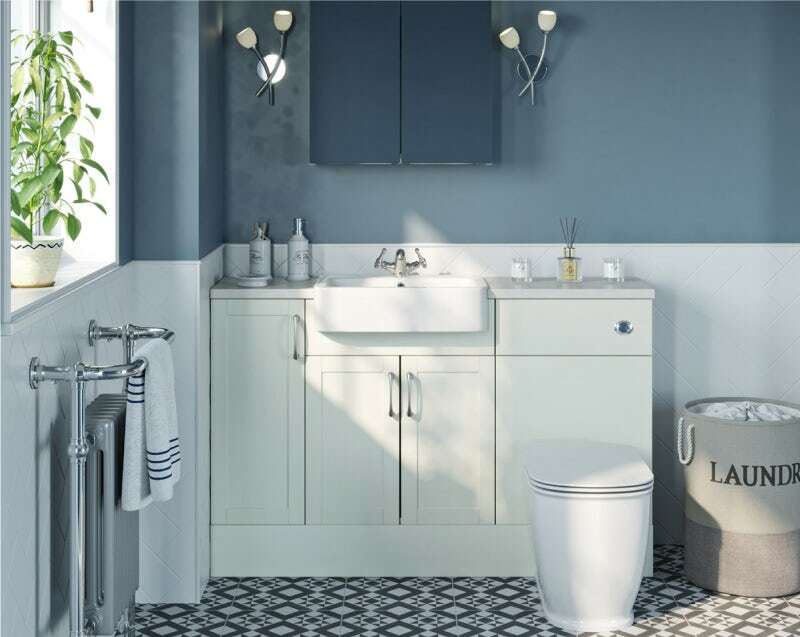 Exclusive to The Bath Co., the home of timeless, traditional design, Newbury fitted furniture is ideal for classic bathroom settings, with a range of pre-assembled packages to fit cloakrooms and ensuites, as well as family bathrooms. Available in your choice of white or a dusk grey woodgrain finish, each unit is supplied fully assembled, so installation is easy. Made from moisture-resistant engineered wood, they come with a full range of units, plus colour-matched plinths and bath panels. Square edged laminate worktops in your choice of white claystone, ferro grey and beige granite finishes, produce a clean and elegant design. Nouvel is new to our fitted bathroom furniture range. Exclusively designed for Mode Bathrooms, it is highly contemporary, producing a high-end, designer look that is simply stunning. Featuring an on-trend gloss grey finish, it is precisely manufactured using water-resistant engineered wood for supreme durability. What’s more, you can buy as a pre-selected bundle or purchase each unit individually, depending on your requirements. 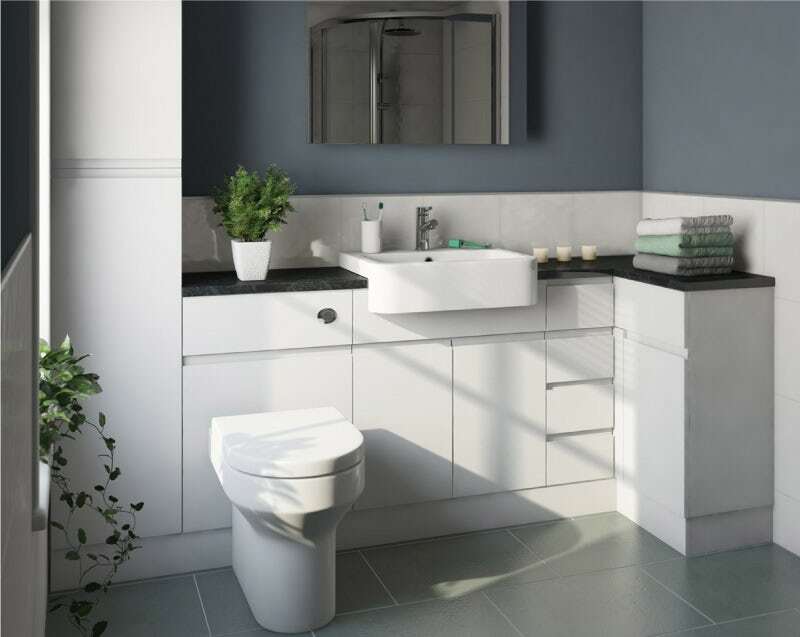 Arriving pre-assembled for speedy installation, this stylish fitted furniture comes with wall fitted storage as well as floorstanding units, making optimum use of your bathroom space. With a choice of stone effect laminate worktops, you can also select colour-matched bath panels for a coordinated look and feel. 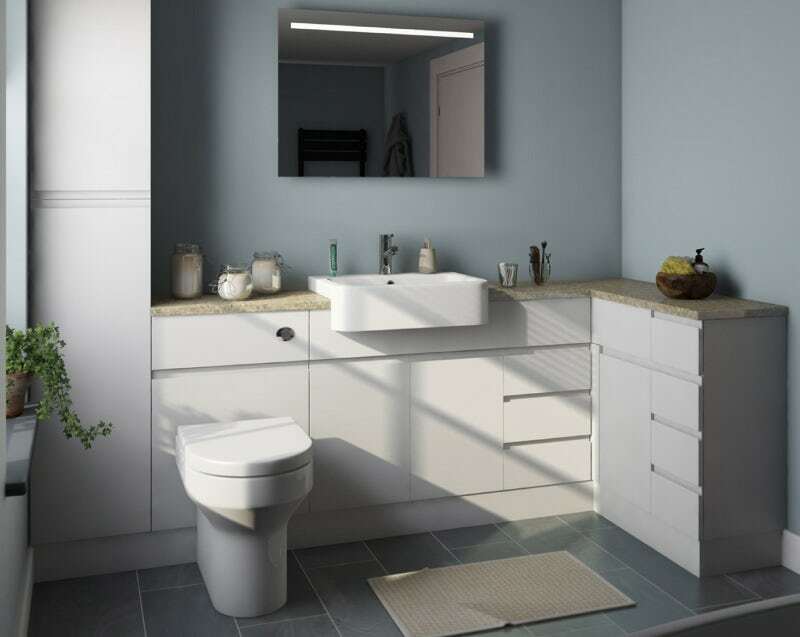 For small bathroom spaces like cloakrooms, every inch of storage space counts. As long as you have a suitable wall that will support it (consult a a professional builder if in doubt), you could use a combination of floorstanding and wall hung units. 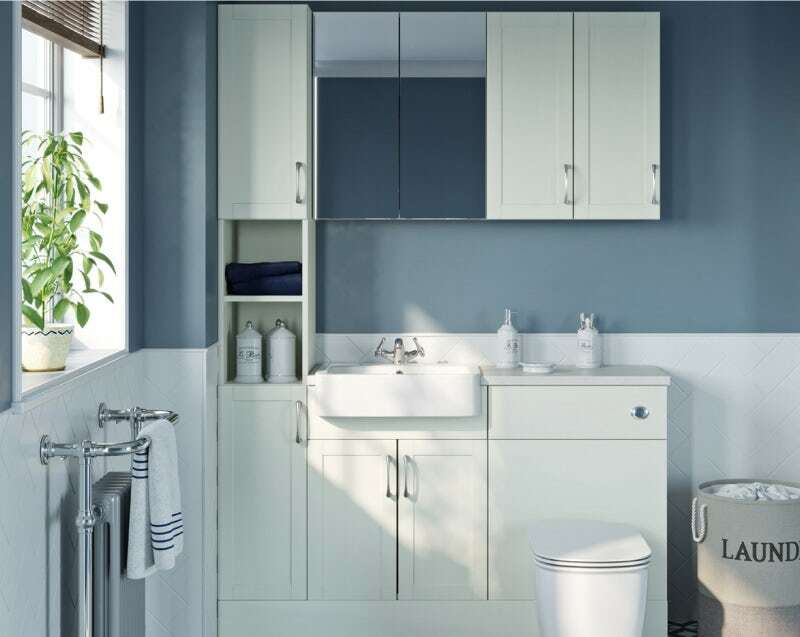 This single wall layout is ideal for small bathrooms or ensuites and contains everything you need for a clean and tidy finish, including storage cupboards, back to wall toilet, tall cabinet, basin and vanity unit. A matching mirror cabinet helps to enhance the feeling of light and space. If you have a little more space to play with, you could potentially utilise an L shaped layout. A combination of cupboards and drawer units provide handy storage for different sized items. This design is perfect for family bathrooms where a bath is required. 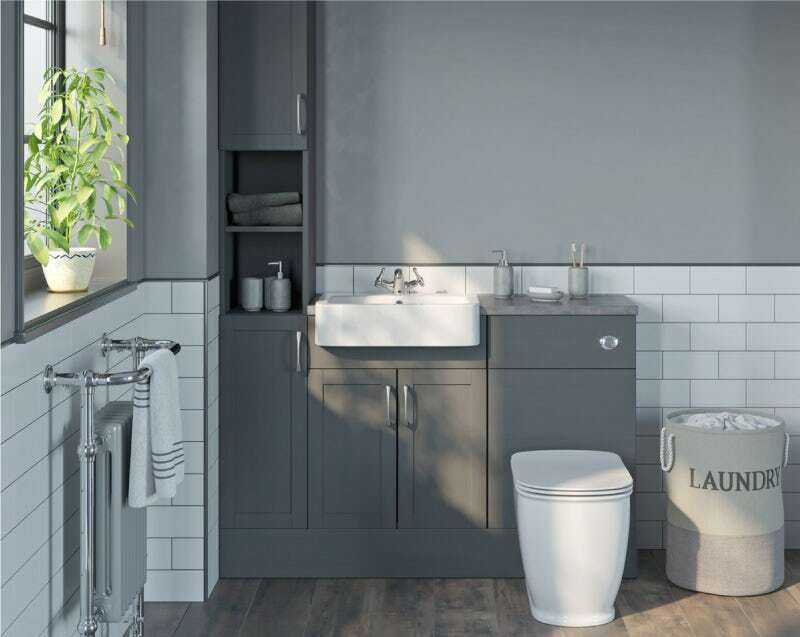 If a fitted bathroom sounds just the type of thing you're after, why not browse our range of stunning fitted bathroom furniture today?